The Twenty-First Judicial District Commission on Judicial Performance, by a vote of 10 to 0, unanimously recommends that Judge Gretchen B. Larson BE RETAINED. 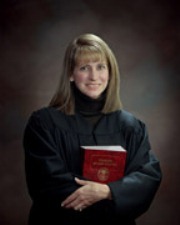 Judge Larson attended undergraduate school at Southern Methodist University. She received her law degree from the University of Colorado in 1993. Judge Larson was sworn in as a Mesa County Court Judge in 2006. She previously worked as a prosecutor for the District Attorney’s offices in the Twenty-First Judicial District (Mesa County) and the Ninth Judicial District (Garfield, Pitkin and Rio Blanco Counties). The Commission conducted a personal interview with Judge Larson, reviewed opinions she authored, observed her in court, reviewed a written self-evaluation and reviewed surveys sent to attorneys and non-attorneys. Non-attorneys included witnesses, law enforcement, litigants, jurors and employees. Of attorneys completing the survey, 84% recommend that Judge Larson be retained in office and of the non-attorneys completing the survey, 90% recommend that she be retained. Judge Larson presides over a mixed criminal and civil docket in the county court. She is described as fair and knowledgeable in the law. Her efficiency and ability to manage a busy docket were noted as strengths. Judge Larson has strong communication skills and her demeanor is appropriate, attorneys described her as prepared, neutral and respectful to all parties. Judge Larson was integral in the successful implementation of significant bail reform in Mesa County, which began in 2013. New bond guidelines focus on evidence-based risk levels regarding the risk a defendant poses to the community and the risk of future non-appearance in determining the appropriate bond. Judge Larson indicated the change was, initially, difficult but adjusted her practices to implement these changes resulting in higher risk defendants being held and lower risks defendants being released on their own recognizance, thus, improving the use of jail space. Implementation of this program helped lead positive change in Mesa County that was recognized in a 2015 Criminal Justice Innovations Award from the Association of Prosecuting Attorneys.